<위로의 모양>은 관람객의 소리로 완성되는 인터렉티브 미디어 아트 전시다. 석유를 비축했던 탱크 내부 전시장은 관람객이 발을 구르기만 해도 터-엉 터-엉 길게 흩어지면서 소리가 울린다. 쇠로 된 커다란 종 같은 이 독특한 공간은 외부의 소리를 차단하는 한편, 내부의 특정 소리를 기이하게 뭉개진 형태로 증폭시킨다. 특히 음성 언어로 발화된 것은 의미를 알아듣기 힘들 정도로 흐트러져서 퍼진다. 누구씨, 하고 이름을 불러도 잘 전달되기 어려운 공간에서 뜻밖에 명료하게 들리는 것은 설치된 소리 오브제에서 나오는 언어 아닌 소리들이다. 관람객은 어두운 전시장의 중앙에 앉거나 서서, 소리로 둥근 원을 그리며 이동하는 사물들의 행렬을 본다. 희끄무레한 빛을 받으며 각자 소리내는 사이렌들의 모양. 그러나 그들은 그렇게 유혹적이지 않다. 그들 사이에는 어떤 일관된 규칙이나 약속도 없는 것처럼 보이지만… 공간 안에서 서로 연결되어 있다. 휘잉 하고 바람이 부는 소리, 공사장에서 움직이는 기계 소리, 풀벌레 소리, 자전거 페달을 힘껏 밟을 때 체인이 움직이며 바퀴가 굴러가는 소리, 목에 종을 단 양 떼가 지나가는 소리, 오토바이 소리, 그리고 오래된 돌림노래(Summer has come in)의 허밍. 이 모든 소리들은 점점 커지면서 팽창하는 하나의 복잡하고 독특한 리듬을 만들어낸다. 하나의 점으로 끌어당기는 사이렌의 노래가 아니라, 각각이 무수히 많은 사이렌이 되어 내는 소리, 그리고 그것들의 관계가 만드는 리듬. 그것이 일어나는 공간과 시간이 어디에선가 끌어당겨져서 온다. 걸어가거나 굴러가거나 옆에서 소리내고 있는 존재를 어떻게 대할 것인가. <위로의 모양>은 존재들의 다른 관계와 다른 차원을 이야기하는 것처럼 보인다. 소리 오브제들은 관람객에게 어떤 시간, 어떤 공간을 환기시키지만, 그것은 어디에도 없었던 것이다. 존재하지 않았던 시간의 환기. 나에게는 아주 분명하게 느껴지지만 다른 이에게 언어로 설명하려고 하면 흩어지거나 아주 멀어져버리는 것, 살갗에 닿았다가 사라지는 감각 같은 것. 이 이상한 환기로 인해, 적어도 우리는 다른 차원에서 만난다. 언어의 땅에 발 딛고 있지 않은, 허공에서 잡히지 않지만 분명히 존재하는 감각으로. 각자의 공상이 리듬을 만드는 이 우주에서는 마이크 모양의 조명이 깜빡이고, 나선형의 네온사인, 자동으로 가끔 연주되는 북이 논리나 개연성 없이 만난다. 여기에 관람객은 너무도 현실적이고 명징해보이는 사물인 스마트폰을 이용해 소리를 낸다. 관람객의 소리가 행렬의 어느 오브제에서 어떻게 울릴지는 알 수 없다. 그렇지만 관람객의 소리는 어둠 속 어딘가에서 불규칙한 맥박처럼 뛰며 이 리듬에 합류한다. 리듬 전체를 다른 것으로 변하게 한다. <위로의 모양>이 만들어내는 이 리듬, 이 우주는 들뢰즈•가타리가 리토르넬로에 대해 설명했던 것을 떠올리게 한다. “어둠 속에 한 아이가 있다. 그는 공포에 사로잡히지만, 노래를 흥얼거리면서 안정을 되찾는다. 그는 노래에 이끌려 걷다가 멈추어선다. 그는 길을 잃었지만, 할 수 있는 한 몸을 숨길 곳을 찾거나, 조그마한 노래를 의지해 겨우겨우 방향을 잡는다…” 그러나 석유 탱크 전시장의 외부에서 비가 세차게 쏟아지면, 내부의 소리들은 먹먹히, 하나도 들리지 않게 된다. 연약하고 불확실한 리듬에만 의지해서 나아가는 이 행진. 언제고 부서지기 쉬운 연결인 한에서만, 이것은 관람객에게 실낱같지만 분명한, 자신만이 부를 수 있는 하나의 모양이 된다. 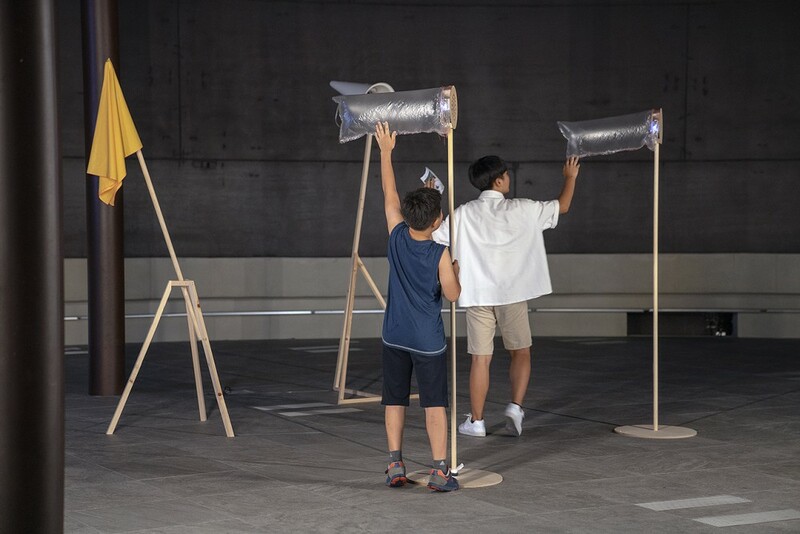 The Shape of Consolation is an interactive media art exhibition that becomes complete by the sounds and voices of the visitors. 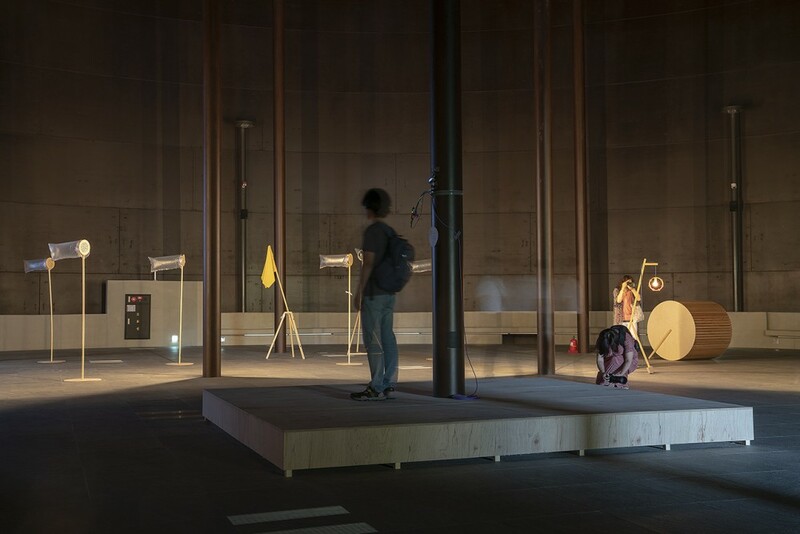 Inside the exhibition space, which used to be the oil tank, makes even the stomping sounds of the visitors scatter and resonate in a deep and hollow sound. 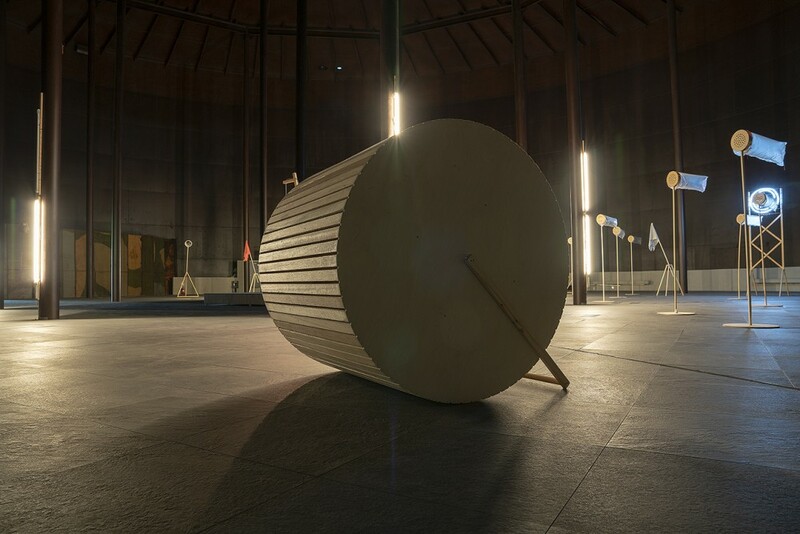 A unique space, which resembles an enormous cast iron bell, at once shuts off the outside noise, and amplifies the particular sounds inside in a strangely mashed-up manner. The sounds enunciated in verbal language create particularly unrecognizable echoes. 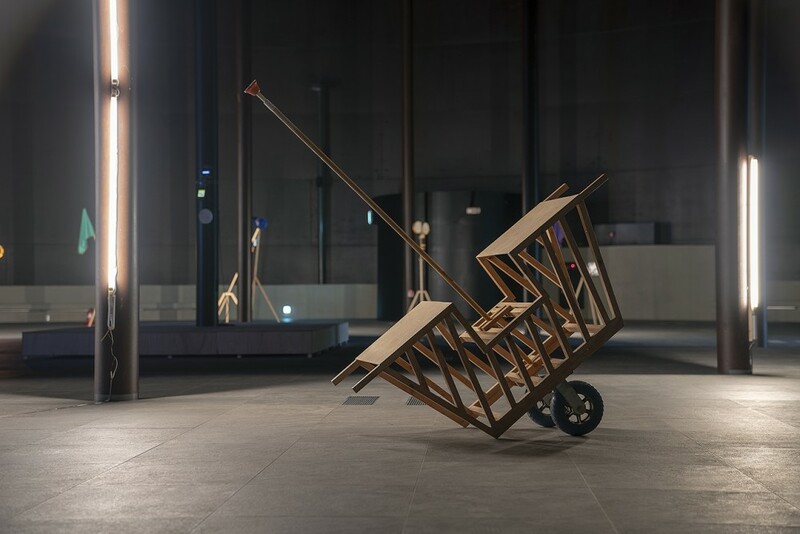 In a space where even the name of a person called out from across the hall cannot be properly heard, what makes an articulate sound is the nonverbal sounds that come from the objects installed in the exhibition space. 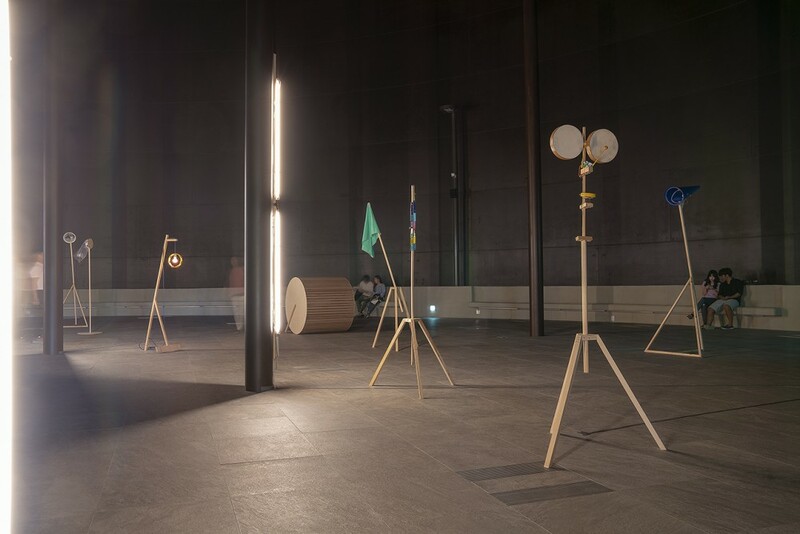 Visitors sit or stand at the center of the darkened exhibition hall looking at the objects creating sounds and marching in circle—the shapes of sirens that make respective noises under the dim light. However, they are not overtly enticing. Although they do not seem to have a coherent rule or agreement, they are connected to one another within the space. The sound of wind blowing; that of machines operating at the construction site; that of crickets chirping; that of bicycle wheels and chains moving as the rider is pedaling the bike; that of a flock of sheep passing with the bells tied around their necks; that of a motorbike passing by and humming sounds of the oldest English round, “Sumer is icumen in” (Summer has come in). All these sounds get gradually louder and expand to create a complex and distinctive rhythm. 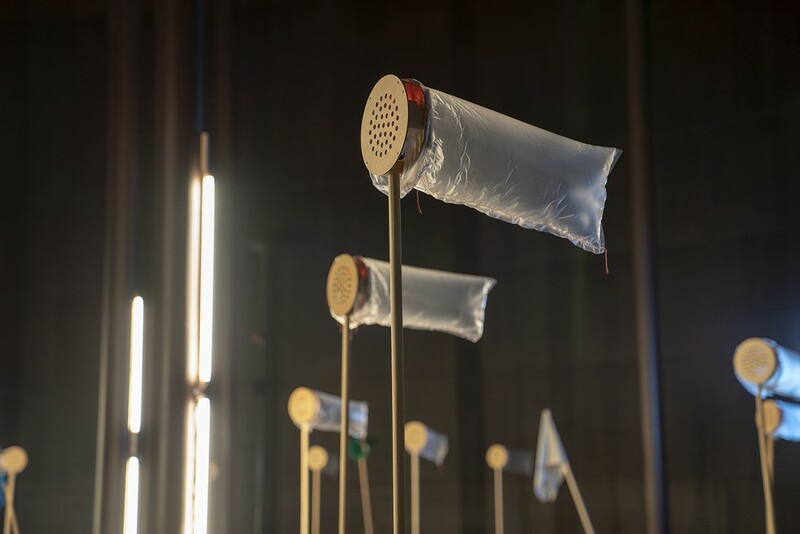 It is not the siren song that pulls all the sounds into one point, but the sounds made by innumerable sirens as each becomes the siren, and a rhythm is created by their interactions. The time and space in which these actions take place are drawn in from somewhere. How do we treat the beings that create sounds as they walk, trundle, or stand nearby? The Shape of Consolation seems to tell a story of different relations and dimensions of each being. 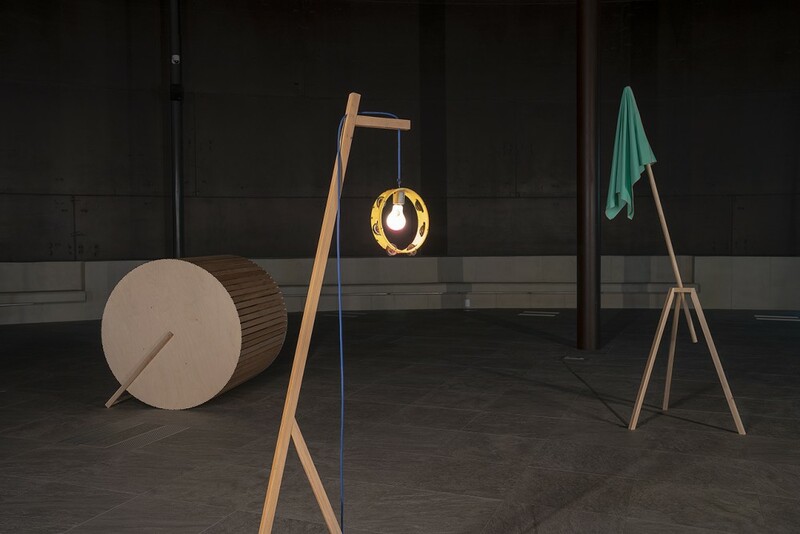 The sound objects remind the visitors of a certain time and space, but it is something that never existed anywhere. To be reminded of a time that never existed. Something that I can clearly feel, but one that scatters or recedes as I try to explain it to someone else. The sensation that is felt on my skin, but disappears. Due to this strange reminder, we, at least, encounter in another dimension—with the sense that is not grounded on the land of language; one that clearly exists, but cannot be grasped in the void. 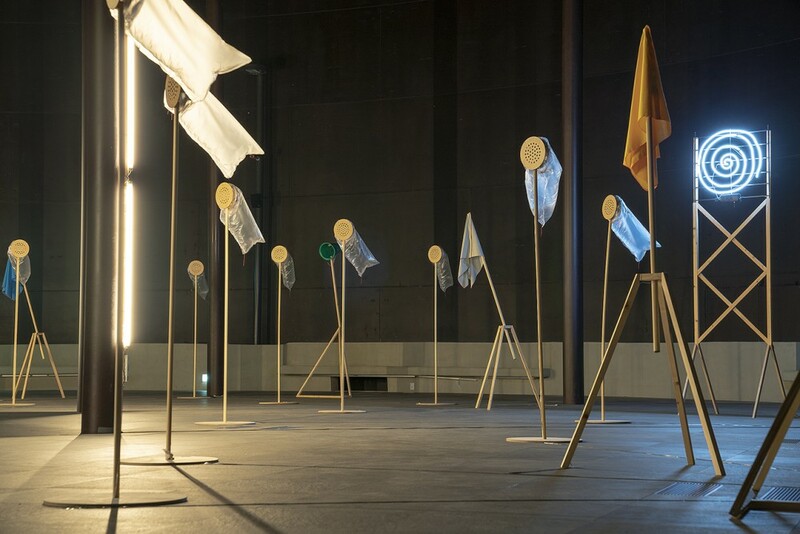 In this universe, where each one’s daydream creates a rhythm, the flickering light of the microphone-shaped lighting, the spiral-shaped neon light and the drum that gets played automatically in an intermittent manner encounter without any apparent logic or plausibility. 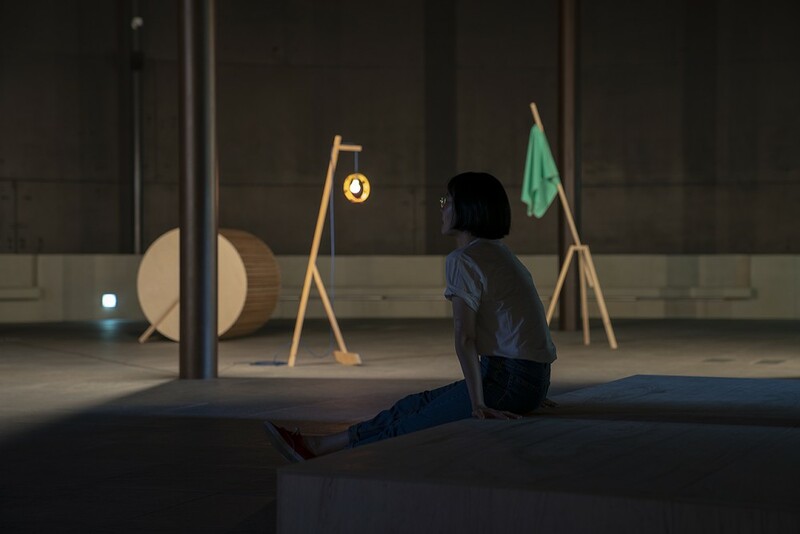 In addition to this, the visitors make sounds using the installed smartphone, which appears to be too clear and realistic. 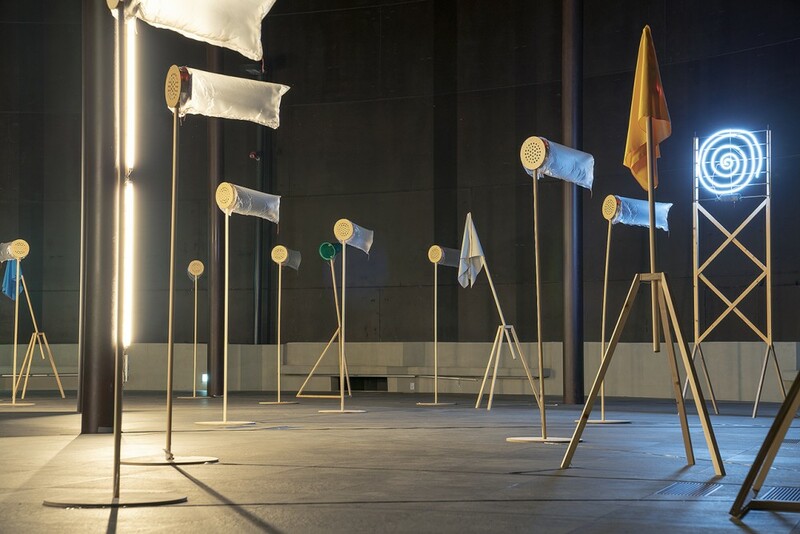 We cannot predict which one of the marching objects will convey the sound of the visitors. However, their sounds join in the rhythm like an irregular pulse coming from somewhere in the dark. 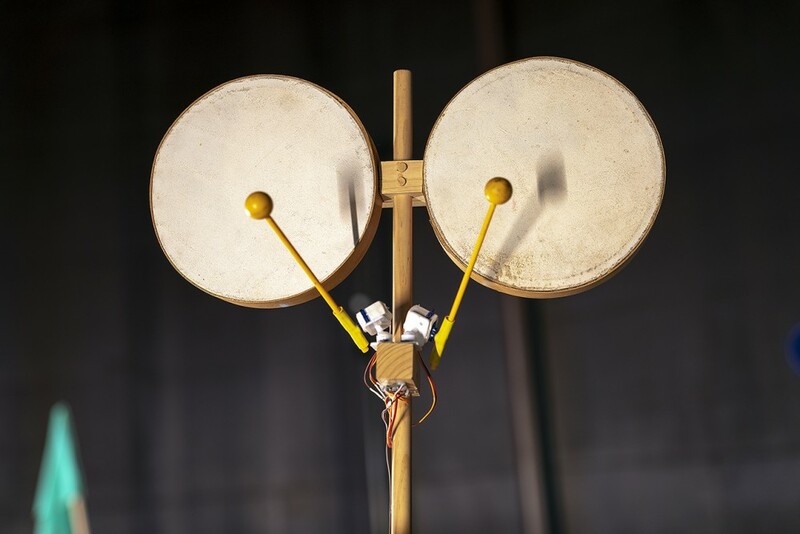 This transforms the entire rhythm into something else. 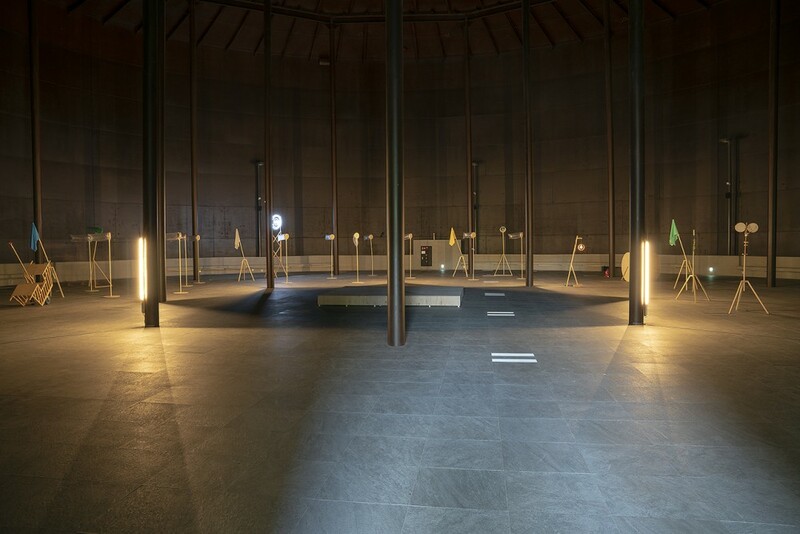 However, when it rains outside the old-oil-storage-tank-turned exhibition hall, the sounds inside are deafened and cannot be heard at all. This march only relies on the vulnerable and uncertain rhythms. Nevertheless, so long as it is a fragile connection that can be broken any time, it becomes a faint, yet distinct shape to the visitors that can only be sung by them.